The original purpose of the Last Skipjacks Project was to figure out how many skipjacks were left. But before you can count how many remain, you have to decide what you are going to count. Oyster Catcher (Connie Francis): A Skipjack? For the purposes of this Project, the skipjacks included are all wooden boats that either currently are or once were generally considered as skipjacks. No fiberglass-hull boats are included. 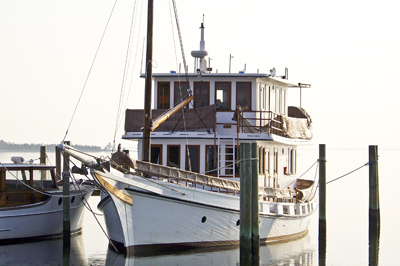 Most look like the traditional Chesapeake Bay oyster dredging vessel, with one raked mast, one huge main sail and one jib. There are a few included that were built as traditional skipjacks and worked as oyster dredgers, but now have been transformed into utterly different looking vessels, like Connie Francis, above, which was found renamed as Oyster Catcher, looking nothing like her skipjack origin. Some are still working as oyster dredge boats. Some have new life as tourist vessels. Some are being restored. Some are abandoned wrecks, parts of them still visible, but essentially dead boats. The boats included have been divided into those that originally were built to be dredge boats (whether or not they still serve that purpose), full-size skipjacks that originally were built to be recreational vessels (whether or not they now may work as dredge boats), smaller or "baby" skipjacks under about 30 feet on deck and originally built as pleasure craft, and those boats that have been lost since the Project began. There are some boats that have the traditional skipjack hull, but their two-mast sail rig had them generally called "three-sail bateaux" rather than skipjacks. While we have not been keeping track of these as we have the traditional skipjacks, it finally became apparent that they should be included as a separate category, as they have been known to change rigs and become acknowledged as skipjacks. We welcome any additions to this list. Those three-sail bateaux that have been reconfigured to a single-mast skipjack rig and now are called skipjacks by their owners and fit the general description have been included in the appropriate skipjack categories. This website is still under construction. Anyone with information to contribute is encouraged to use the contact link below to help keep the site up to date and accurate. The first priority is to provide the latest known information on the home port and status of each boat. Each boat's page will include, where available, information on the year and place she was built, name of the builder, length on deck (LOD), dredge number (if applicable), and links to the owner's website and any Coast Guard record. Once that framework is in place, the thousands of photos taken of these boats since the project began in 2009 will be sorted and formatted to provide visitors with views of these lovely ladies, whether they are looking their finest having been newly restored or are falling apart and about to disappear. Finally, each page will be filled out with some of the history of the boat, if known. Especially for the older boats and some of the pleasure craft, the past can be uncertain. Additional information is always appreciated.